The Syrian Swing: Will the Russian-US Ceasefire Plan Work? We have a situation in which Russia, the United States and regional players understand that they need to adjust their approaches. Previous attempts to bring about a sustainable cessation of hostilities in key areas have failed, even the February agreement that outlasted all other similar initiatives. The Syrian government and armed opposition groups blamed each other while still clinging to illusory plans to settle the conflict by military means. The last two rounds of the intra-Syrian talks in Geneva were derailed. The parties involved have never been able to start substantial talks on how the transitional period would proceed, as required by UN Security Council Resolution 2254 and other international agreements and instruments. However, since the resumption of hostilities after the failure of the political process in April, neither government forces nor the opposition were able to secure a durable advantage. Victories were followed by defeats, and this pendulum kept swinging until recently. The Syrian regime, with support from the Russian Aerospace Forces, succeeded in blocking the eastern part of Aleppo, cutting off northern supply routes used by the militants, as well as to somewhat stabilize the situation around Damascus and in the Idlib province close to Latakia, the stronghold of the terrorist group Jabhat Fateh al-Sham, previously known as Jabhat al-Nusra. At the same time, the Syrian regime suffered a number of painful setbacks that eroded its manpower and resources, forcing the army to stretch its forces over long distances and depriving it of the ability to conduct efficient offensive operations. This became clear in June, when Suqur al-Sahara, an elite unit within the Syrian army, launched an offensive on a desert road to Tabqah and failed. In August, detachments from various opposition groups succeeded in mounting a counter attack in southwest Aleppo, near Ramus, taking warehouses with arms and equipment. As they fought for Aleppo, they started to coordinate their operations under the Jaish al-Fatah banner. The opposition has also expanded the area under its control north of Hama and in areas to the south of Aleppo province. Taking Aleppo, a key strategic center, turned out to be a bridge too far for the government troops. This was a serious miscalculation, which further complicated the situation on the ground as well political efforts. A long siege means that troops will have to be diverted from other theaters. It is also damaging in terms of international efforts. The same thing happened in Sarajevo, where a long blockade ended in the military and moral defeat of the Serbs. Despite all the pitfalls, both predictable and unpredictable, the plan of action for Syria that was developed at the instructions of Russian and US presidents is in many ways different from the previous agreements and roadmaps. This is not just another call to cease hostilities. Judging by what has been announced, we can conclude that this time around we have a comprehensive and far-reaching package that sets out phases with specific military and political elements. The final aim is to create an environment that would set the stage as soon as possible for substantial intra-Syrian political negotiations on the transitional period and the future of the Syrian state. The plan starts with a trial period aimed at building confidence. The cessation of hostilities is expected to last for 48 hours, and if respected, it will be extended for another 48 hours. If it holds for seven days, a Joint Implementation Center will be established, in which the Russian and US militaries will exchange information, delimitate areas held by various armed groups and coordinate strikes against the “Islamic State” (which is banned in Russia) and Jabhat Fateh al-Sham. By entering into these agreements, the two countries have significantly elevated their cooperation in fighting terrorism, and taken a step towards forming a coalition. Until now, discussions on forming a coalition were more like a vanity fair: who is leading and who is being led, and who should join whom. Second, the two countries made mutual concessions in order to link two key elements of the plan: preventing the Syrian air force from flying in areas agreed by Russia and the US, and separating Jabhat Fateh al-Sham, which both Russia and the United States view as a terrorist organization, from other armed groups. If they are willing to stop working with the jihadists, they will not be targeted by air strikes. Otherwise, Russia and the US will regard them as terrorist groups and, therefore, legitimate targets. This approach has been coordinated with the Syrian government and approved by the opposition, even though with certain caveats and some groups withholding support. According to John Kerry, the opposition is ready to provide the relevant evidence, but still has the right to self-defense. The US Secretary of State has called on the moderate opposition groups to distance themselves from Jabhat Fateh al-Sham and respect the ceasefire so as not to come under attack. Third, the plan envisages the creation of a demilitarized zone in the north and south of Aleppo, permitting unhindered humanitarian access to suffering civilians. 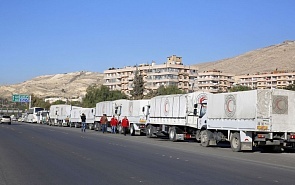 The documents that were adopted by Russia and the US set out procedures and mechanisms for delivering aid in coordination with the UN, which until recently was subject to certain restrictions by the Syrian authorities. It is also encouraging to see the recent shifts in the region that may indicate a changing balance of power and the emergence of new ties that, while perhaps not as strong as an alliance, are still important tactical unions focused on resolving the Syrian conflict. At the same time, prior alliances are increasingly facing challenges. We have a situation in which Russia, the United States and regional players understand that they need to adjust their approaches. This primarily applies to Turkey. Even before the failed coup attempt, Ankara had started to look for ways to gradually revise a policy that had led its relations with neighboring countries into an impasse. Turkey’s former policy of “zero problems with neighbors,” announced by the previous prime minister, had evolved into “zero neighbors without problems.” It has become clear that not only did fighting a war on two fronts against al-Assad and the Kurdish militia fail to yield any positive results; it also resulted in more terrorist attacks by ISIS. In addition, tensions were mounting with the US over the Kurds, who proved to be highly effective at conducting counter-terrorist operations in northern Syria. This offered Kurdish Democratic Union Party’s self-defense forces an opportunity for the first time to connect their Afrin and Kobani enclaves and form a territorial unit on Turkey’s southern border. But the hardest political and economic blow to Turkey resulted from the rupture in relations with Russia. The tentative rapprochement, whether dictated by situational or global and far-reaching considerations, paves the way to reaching mutual understanding and common ground on Syria. Having dealt with the failed coup attempt, Turkey has become more flexible, focusing on Syria’s territorial integrity and no longer emphasizing regime change or insisting that “Assad must go immediately.” The goal of joint operations carried out by the Turkish armed forces and the Free Syrian Army in northern Syria is twofold: clear the border areas to the east of the Euphrates River of ISIS, as well as the Kurds, whom Turkey also regards as terrorists. This tactical shift by Turkey is sure to affect future developments. So far it is hard to say whether and to what extent the impact will be positive or negative. It will largely depend on Ankara’s willingness and ability to seal its border in order to prevent terrorists from gaining new fighters and arms, as well as on the evolution of Turkey’s relations with other Syrian armed opposition groups, many of whom, including Ahrar al-Sham, are viewed as terrorist groups by Russia, as well as by some Arab states such as the UAE, Jordan and Egypt. Turkey’s move to restore relations with Russia coincided with an effort to step up diplomatic contacts with Iran. Both countries support the Russian-US plan of action and have shown interest in finding mutually acceptable political solutions regarding Syria. Some political observers have even started to talk about an emerging coalition of Russia, Turkey and Iran. Of course, these expectations seem quite superficial, considering their respective global and regional interests and priorities, which do not necessarily coincide. However, both Ankara and Tehran are tired of the burden of war in Syria. On top of political and economic damage, Turkey’s domestic and European policies are suffering from the refugee issue. For Iran, the Syrian campaign is not only a major financial burden, but also a source of mounting casualties, which has already led the Iranians to gradually replace the Revolutionary Guards in Syria with Shia militias from Iraq, Afghanistan and Pakistan. At the same time, Iran cannot afford to lose Syria, since it is an important part of the broader Shia project. Changes are also imminent in Saudi Arabia, as it faces increasing challenges from fighting on two fronts – the first being its covert actions in Syria, and the second - its open engagement in Yemen, where it is suffering big casualties. The situation became especially complicated for Saudi Arabia when ISIS and Al-Qaeda entered the fight for Yemen’s southern provinces bordering Saudi Arabia. However, Riyadh still has the financial reserves to continue for some time with its strategy to form an Arab front against Persian expansion, even though it has so far proven ineffective. In any case, both Iran and Saudi Arabia view Turkey and its changing tactics in Syria as an opportunity to gauge the possible concessions from the adversary at the stage when it comes to discussing issues on Syria’s political future. The Saudis were quite receptive to Ankara’s milder rhetoric regarding Assad’s future, and responded with relative restraint to Turkey’s attempts to lure part of pro-Saudi Islamist armed groups into its sphere of influence. Even if the cessation of hostilities holds for the period envisaged in the deal, implementation of the package of agreements, which stipulates overlapping commitments, will still be very challenging and even unprecedented in terms of conflict settlement. It can only be compared to the Dayton Accords in terms of its complexity. However, the Dayton Accords were concluded by states, with an international NATO force, in cooperation with Russia, mandated to enforce peace. This time, the success of the initial stage will largely depend on the ability of Russia and the US to deliver on their commitments to influence their respective partners. The approval of the plan by Damascus should be backed by concrete statements, written confirmation or even a warning, if necessary, against violating the new airspace regime. Assad’s latest statement on the eve of the cessation of hostilities coming into force about liberating every sliver of Syrian land is not in keeping with the Russian-US plan. The US also faces a daunting task. Many commanders of armed opposition groups, both secular and Islamist, view the Russian-US agreement as a deal that would be detrimental to the interests of the Syrian revolution. Ahrar al-Sham, a Turkish client, has already made public its refusal to abide by the ceasefire. The Free Syrian Army also regards the Lavrov-Kerry agreements as a risky undertaking with little chance of success due to the entanglement with Jabhat Fateh al-Sham on the ground, which makes it difficult to separate armed opposition from terrorists. Importantly, this terrorist organization is one of the most capable opposition groups with a large following among the Sunni population. Now that the clock is already ticking, counting down the hours until the deadline for fighting to stop, it is time to check which parties to the conflict are serious. This is a moment of truth of sorts. Relations between Russia and the US, as well as with their partners, are being tested once again. The deal carries great risks, but continuing the bloodshed with their direct involvement in this regional proxy war would be even more dangerous.